Today and tomorrow I am going to introduce you to my two newest Lisette styles. These are included in Butterick’s Spring 2016 collection, and both are available now everywhere that Butterick patterns are sold. The Butterick style numbers are B6321 and B6331. I hope you enjoy them! Then one summer when my family was away on vacation and I stayed home for a summer job, I stopped at the fabric store and chose fabric and a pattern for a simple jumper. I went home, cut it out, and sewed it up with almost no trouble at all, aside from a little difficultly learning how to make button holes on the sewing machine. I knew exactly what fabric I wanted for the jumper and how I wanted it to look when it was finished, and it turned out almost exactly as I had envisioned, all because I had been watching and learning from my mom all those years. One of the very first pieces I sewed for myself in New York was a short safari-inspired jacket in a deep forest green cotton twill with lots of topstitching and details like belt loops and pockets. I was so proud of how it turned out. It wasn’t a difficult pattern, but it looked impressive, and I felt good about it when it was finished. 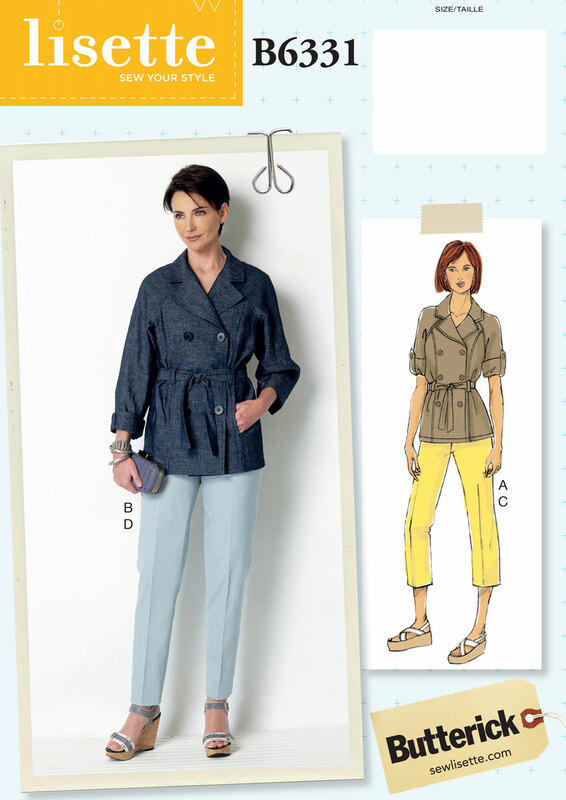 I was thinking about that jacket this morning because the little trench coat included in Butterick B6331 is a similar cut and style to that jacket. It would have been a perfect pattern for me to sew back then. The princess seams make it easy to adjust the fit to your preference (if you need extra room through the bust, princess seams are the way to go! ), and the raglan sleeves are so much easier to sew than set-in sleeves. This pattern also includes those details that look impressive but are actually very easy to sew: collar, front pockets, back shield, elasticized back waist with front ties, and cute little button tabs for rolling your sleeves up. Trench coats are one of those pieces that show up on everyone’s “must have” list of wardrobe basics. To be honest with you, I put no faith in those lists. Everyone is different, and one person’s basics will be completely different from another person’s. It took a long time for me to find a trench coat that worked for me without feeling like Inspector Gadget. But one thing I did discover was that it’s a lot easier to wear a trench coat that’s short rather than hemmed just above the knee, which can sometimes come off feeling a bit stiff and costume-y. We also included a simple pair of narrow trousers in Butterick B6331 because so many of you have asked for them. This is a very easy style to sew, flattering and classic. Probably a wardrobe basic for many of us. The details on this style are totally denim-inspired, but feel free to sew them in fabrics besides denim and chambray as well. Basic black stretch twill would make a really versatile pair you could wear almost every day. But here, too, think outside the box. What would you love to wear? It will be fun to see how you sew these styles. You can find more inspiration on my Lisette: Sew Your Style Pinterest board, and I hope you’ll post your own sewing to Flickr or tag them #sewlisette on Instagram. Full details on the pattern are available on our pattern page for Butterick B6331. Have fun!